Hanshew, Charles, head-of-household, age 31, born in Pennsylvania; completed 3 years of high school; on Apr 1 1935 was living in the same place/area; owned home ($200 value); occupation: acetate dyer, rayon mill; worked 30 weeks in 1939; $900 wages in 1939. Hanshew, Dorothy, wife, age 29, born in Pennsylvania; completed 3 years of high school; on Apr 1 1935 was living in the same place/area. 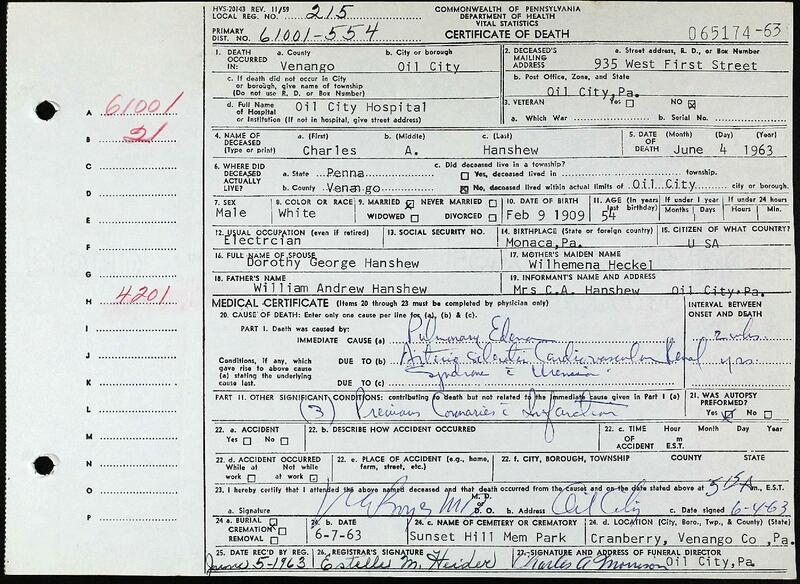 Hanshew, Charles, son, age 8, born in Pennsylvania; completed 2nd grade; on Apr 1 1935 was living in the same place/area. Hanshew, Robert, son, age 2, born in Pennsylvania. Hanshew, Dorothy Janet, daughter, age 5 months, born in Pennsylvania. Charles' obituary was published in "The Derrick" (Oil City, Pennsylvania) on Wednesday, June 5, 19637 and Saturday, June 8, 196311 (see scans below). 1940 census, Greenwood, Crawford County, Pennsylvania; roll T627-3475, ED 20-18, page 5B, line #43, household #89. "The Derrick" (Oil City, Pennsylvania), Dec 21 1965; http://www.ancestry.com. 1910 census, 3rd Ward, Monaca, Beaver County, Pennsylvania; roll T624-1311, ED 35, page 8A, line #30, dwelling #143, family #152. 1920 census, 3rd Ward, Monaca, Beaver County, Pennsylvania; roll T625-1532, ED 50, page 5B, line #95, dwelling #94, family #106. Pennsylvania, Death Certificates, 1906-1963; http://www.ancestry.com. "The Derrick" (Oil City, Pennsylvania), Jun 5 1963; http://www.ancestry.com. "The Derrick" (Oil City, Pennsylvania), Jun 8 1963; http://www.ancestry.com.